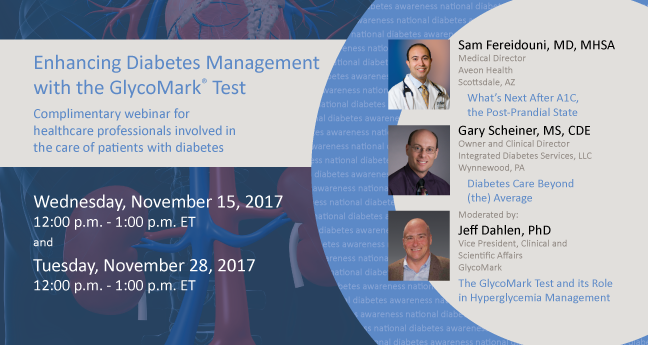 New York, NY (November 2, 2017)—GlycoMark, Inc., the exclusive provider of the GlycoMark® Test, is sponsoring an educational webinar on hyperglycemia and the GlycoMark Test as part of Diabetes Awareness Month. The complimentary educational program is available to all healthcare professionals managing the more than 30 million Americans with diabetes. Sessions will be held November 15 and November 28 from 12:00-1:00 PM Eastern time. The program will include recent data on the risks associated with hyperglycemia, case studies, and the latest strategies aimed at improving the management of patients with diabetes. The expert panel includes Sam Fereidouni, MD, MHSA, past president of the American Diabetes Association Community Leadership Board for Arizona and Medical Director of Aveon Health, a family practice in Scottsdale, AZ that has exceeded payer, national and CMS benchmarks for chronic disease management. Dr. Fereidouni will be joined by Gary Scheiner, MS, CDE, owner and Clinical Director of Integrated Diabetes Services and 2014 Diabetes Educator of the Year. The medical education program will be moderated by Jeff Dahlen, PhD, Vice President of Clinical and Scientific Affairs at GlycoMark, Inc. To register for the program, visit http://glycomark.com/mededweb2017. The GlycoMark Test is the only FDA-cleared serum or plasma blood test that measures 1,5-anhydroglucitol (1,5-AG), a glucose-like sugar found in most foods. Serum 1,5-AG levels fall during glycosuria and rise when glucose control improves, providing clinicians an additional marker, complementary to HbA1C (a 3-month glucose average), for detecting recent hyperglycemia and managing patients with diabetes. GlycoMark and the GlycoMark logo are registered trademarks of GlycoMark, Inc.